On a recent visit to the Smokies, Susan Murphy spent the morning photographing daughters Alana (left) and Mary Caitlin with each of the sixteen colorfully painted bears that now grace Cherokee’s streets and plazas. 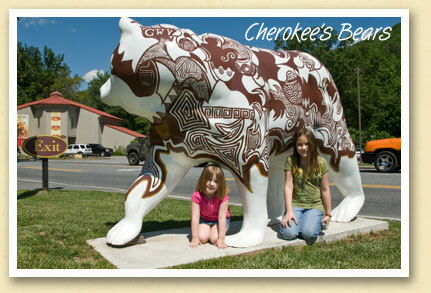 Each bear was created by a local tribal artist as part of a public art program sponsored by the Eastern Band of Cherokee Indians. We had a blast finding all of the painted bears. We met several locals along the way. They were so nice and helpful. I love it when fun can be educational too.